Want to Lower the Prison Population? The prison population in our state is somewhere around 22,000.
at year-end--3.2% of all U.S. adult residents or 1 in every 31 adults." The U.S. has the highest documented incarceration rate in the world. the number of people it locks up, the numbers in America are staggering. Prison overpopulation has become a very real, very urgent problem in most states, so I can't say that it's a surprise to hear about it happening right here in Wisconsin. That it's not unexpected, however, doesn't make it any less appalling. The problem, of course, is that this is a complicated problem with a dizzying array of contributing factors. And everyone has a different opinion about how to best go about solving it. Some folks who fancy themselves real hard asses like to talk about privatizing the prison system to reduce costs, as well as throwing the biggest book at even the most non-violent of offenders. Others fall on the exact opposite end of the spectrum. Me? I land somewhere decidedly in the middle. I think we put too many people in jail, and I think we operate our jails too much like points-of-no-return as opposed to the houses of reform they were supposed to be. In terms of population, this is definitely a case where less is more. The fact that some one million inmates are in for non-violent offenses, too, offends me. Simply having the bad fortune of living with or visiting someone involved in the drug trade can be enough to put you behind bars for the better part of your life. It just doesn't make sense. Don't believe me? Read a few of the personal stories listed on the Families Against Mandatory Minimums website. Our sentencing rules need serious reform. So do our attitudes about things like marijuana, as well as toward addiction in general. Throwing people with a disease, or a relatively harmless plant, into jail is both unjust and wasteful. Taking a long, hard look at our sentencing policies would likely go a long way toward putting a dent in our bloated prison population. What might also help is a solid early release program for non-violent offenders who do deserve some jail time. Gov. Doyle attempted to do that when he passed Wisconsin Act 28 as part of last year's budget. The provision was ostensibly supposed to create a system of early-release in order to help stem the increases in inmate population we've been seeing in recent years. ...under the new early release provisions, an individual convicted of aggravated battery to an unborn child is statutorily eligible to earn early release from prison as well as an early discharge from extended supervision once released from prison, while an individual convicted of a nonviolent offense such as misconduct in public office is not eligible for early release from prison or an early discharge from extended supervision. Now don't get me wrong – I'm not arguing misconduct in public office – or any other felony, for that matter – aren't serious offenses, but they're certainly not as seriously assaultive as a crime like aggravated battery to an unborn child. There's a full list of the other offenses that fall under the new early release program at the same post linked above. They include things like stalking, false imprisonment, and physical abuse of a child. Those are decidedly not non-violent offenses and I have no idea how they ended up on this list. But say we did (eventually) get the early-release program right. That's not enough. We need to couple that with comprehensive rehabilitation and reentry programs that help people returning to society with things like education, job preparedness, finding a place to live, etc. Just turning people out onto the streets does little to nothing to prevent recidivism—which, after all, is supposed to be the point of putting people in jail for less than a life sentence. Thankfully, there are such programs in place in many of our state's detention facilities: everything from a successful MATC accredited horticultural program to high school equivalency programs and even a prison library program. Kyle Nabilcy, a prison librarian, has witnessed the success of the program first-hand. 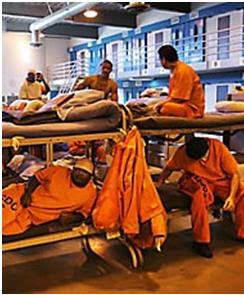 "Anecdotally," he notes, "I can tell you that very few of the men who have worked for me as inmate clerks have returned to a similar or higher security level of incarceration, or reoffended. I can only think of two out of probably 30-35 in almost seven years." Nabilcy also went on to suggest a different use for any state funds earmarked for prisons. "I would love to see some of that money going into improving the technological infrastructure of DOC. More and more of the educational programs are digital, and our resources are getting more and more out of date every day." Once again, prevention and education seem to be the most important tools for fixing the problem. Edited From New Age Magazine, January/February 1999. There is a growing movement across the country called restorative Justice, also known in spiritual circles as transformational justice. The idea behind it is simple: Bring a person convicted of a crime together with his or her victim amid representatives or mediators from the broader community, and let everyone involved help to describe the offender’s sentence or restitution to the victim. All this takes place outside the court system and results in reparations, not prison time. Restorative justice advocates believe that the adversarial nature of America’s criminal justice system divides communities, deepening the wound caused by the crime. By bringing a community together, they hope to heal those wounds –and perhaps even transform lives . Such circle develops sentences by consensus, passing a feather or talking stick around and speaking one voice at a time. They can include the victim, the offender, family, friends, employers, and probation officers, as well as members of the community who don’t know the victim or the offender. Judges, too take part in sentencing circles, though they leave their robes in the court house. This volunteer community knows a corner is being turned; the offender could be the client for its first sentencing circle. According to the update, the client has been extremely attentive. But now that he has to decide who will be in his support group, he’s reluctant to impose on his family members and associates. Maybe he’s worried about what he’ll owe them. Transformations like the one that could await him are impossible to price. Someone mentions “the grandma rule”used by other groups: find the grandma or other person whose opinion counts most of all for the offender, the one he or she usually wants to keep out of the process. Then pick that person. But the client in this case seems to be resisting. He may turn out to need a long support relationship. For now, the judge is the groups safety net. He and the groups consensus process are both protections against vigilantism. The judge is the responsible one who will signoff on the sentence they come up with. They are the ones who are reaching out beyond traditional hierarchies and systems, making up rules as they go along for their community’s needs and purposes. Experience will tell them what to save and what to throw away, what to say and not say, what to remember and what to forget. The idea behind restorative justice is actually a return to traditional roots. The concept has been traced to aboriginal systems of consensus-based community decision-making developed and adopted over centuries in Australia and New Zealand. Some people also point to the age old ways behind the Navaho Court and sentencing circles of Canada’s First Nations. Probably The Quaker example of consensus and bearing witness was the one of the first European examples. In the 1970’s the Mennonites launched the modern restorative justice movement in the US by starting the first victim-offender reconciliation programs in Elkart, Indiana and Kitchener, Ontario. This was also a time when former members of communes developed “group process training” particularly in the MOVEMENT for a New Society in Philadelphia. This led to a wave of dispute-resolution and community mediation groups that have since worked to clear up everything from toxic waste spills to play ground fights. Internationally, restorative justice is taking root indifferent forms. Germans seem committed to victim- offender mediation, which also is attracting interest in Northern Ireland . Sentencing circles have been introduced in the Aboriginal Justice Section of Canada’s courts. Family group conferencing , a form typicall used with young offenders, is in place in Australia and New Zealand. In the US, numerous programs are already in place. Family group conferencing has been used with hundreds of young offenders in Minneapolis and Bethlehem, PA. Real Justice, a 4-year –old private non-profit organization that helped introduce conferencing to the US, has also trained police officers, educators, community leaders and others to do conferencing in Vermont , Indiana, Virginia and Colorado. Other pilot programs are under way in Florida and Illinois. The article goes on to state the results of numerous studies that show these programs work-a majority offenders successfully negotiate agreements to restore victims losses, victims are less fearful of re-victimization and are more satisfied, offenders are more likely to go through the program and less likely to reoffend. Results are similarly good with family group conferencing. “The heart is the key, “says Lucinda Brown of Reinventing Justice, a grpoup that has helped guide sentencing circle groups in Massachusetts. “Without it , the process will be just one more way to settle, one more way to punish. It’s a slow way, but it’s a safe way to have conflict. In a circle, if 3 or 4 people make you furious, you know you’ll get your say when the feather is passed to you. “ As Brown points out, the success usually lies with the community. “ Is the offender connected to the community enough? If the offender isn’t interested in being in the community, it won’t work. . And when people ask where is the community that would do this, we say that this process builds community.